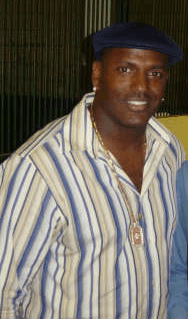 Rubén Angel Sierra García (born October 6, 1965) is a former Major League Baseball outfielder. Sierra goes by the nicknames El Caballo and El Indio. Over 20 seasons, Sierra played for the Texas Rangers (1986–92, 2000–01, 2003), Oakland Athletics (1992–95), New York Yankees (1995–96, 2003–05), Detroit Tigers (1996), Cincinnati Reds (1997), Toronto Blue Jays (1997), Chicago White Sox (1998), Seattle Mariners (2002), Minnesota Twins (2006). Sierra graduated from Liceo Interamericano Castro High School in Puerto Rico in 1983, where he played baseball, basketball and volleyball. In November 1982, the Texas Rangers signed 17-year-old Sierra out of Puerto Rico. Sierra made his major league debut on June 1, 1986 as an outfielder and hit a home run in just his second MLB at bat becoming the first Texas Rangers player to accomplish this feat. Sierra had a decent rookie year hitting .264 with 16 home runs and 55 RBIs. In 1989, Sierra hit 29 home runs, and led the league in RBIs (119), slugging (.543), and extra bases (78). Despite superior numbers, he finished second in MVP voting to Robin Yount, who was a superior defender on a better team. He went on to have 3 years with 100+ RBIs with the Rangers. In August 1992, the Rangers traded Sierra to the Oakland Athletics for José Canseco. He later played more years with the Rangers. In 1995, the A's traded Sierra to the New York Yankees for Danny Tartabull. After helping the Yankees reach the playoffs for the first time in 14 years in 1995, Sierra was traded to the Detroit Tigers with Matt Drews for Cecil Fielder. Sierra was considered a journeyman because of playing for numerous teams during the late-1990s, including the Reds, Blue Jays, and White Sox. After making a comeback with the Rangers in late 2000, he would go on to achieve moderate success with the Rangers in 2001, winning AL Comeback Player of the Year, and Mariners in 2002. In 2003, during Sierra's third stint with the Rangers, he was traded back to the Yankees, who were looking for a power-hitter off the bench. Sierra was an important part of the 2004 Yankees, a team that hit over 240 home runs. Sierra himself slugged 17 of those homers as the usual designated hitter, playing in 56 games at the position. In Game 4 of the 2004 American League Division Series, with the Yankees down to the Minnesota Twins 5–2, Sierra hit a 3-run home run to tie the game at 5–5 off of reliever Juan Rincón. His clutch home run helped the Yankees rally to win the game and the series. However, he was the final out of Game 7 of the 2004 American League Championship Series, hitting a ground ball to Pokey Reese, which secured the dramatic comeback victory of the Boston Red Sox. Sierra had an injury plagued 2005 season and was let go by the Yankees after hitting just 4 home runs. In 2006, Sierra signed a minor league contract with the Minnesota Twins, but was released on July 10. In August, Sierra was offered a chance to sign on with the New York Mets for the September run and playoffs. However, due to family issues (illness to his mother), he opted not to play again in 2006. In January 2007, Sierra signed a minor league contract with the Mets, who invited him to Spring training. However, on March 20, he requested, and was granted, his release by the team after being reassigned the previous Thursday. ↑ Shpigel, Ben (March 20, 2007). "Sierra Released; Sanchez On the Mend". The New York Times. Twins waive Veteran OF Sierra. No Deal Between the Mets and Sierra.